Southern Railway Tap House is now open in downtown West Palm Beach! Located just beside Off the Hookah on Clematis, I visited the new kid on the block this week and am pumped to report that this is one of my new favs. SRTH is a sister establishment to Off the Hookah, a family-owned and operated restaurant and nightclub with roots in Virginia. The owners/brothers started off in the Richmond area with OTH and branched out with their popular Southern Railway. Seeing the success and following, they decided to bring the concepts to South Florida with locations in WPB, Ft. Lauderdale and Miami. It’s called a tap house, so let’s start there… Sitting down, Funky Buddha, TBC and Cigar City taps caught my eye. I chatted with Henry, Southern Railway’s Bar Manager, and I was thrilled to hear that he’s reserving about 30% of the taps for locals. It’s nice to know that a team coming in from Virginia saw the seriousness of our local craft beer scene right away. The offerings are vast on draught with more available by the bottle – brown ale, IPA, lager, hefeweizen, raspberry, pineapple, you name it. They also have a strong whiskey/bourbon menu. And while the beer is a draw all on its own, the food was what knocked my socks off. Eyeing the menu, you see some interesting sounding bar foods – ordering and tasting is another story. Ed Blasé was brought down to build the menu and he nailed it. Together with Chef Alain they gave me a sampling of some of the items available for dinner and for lunch as of next week. 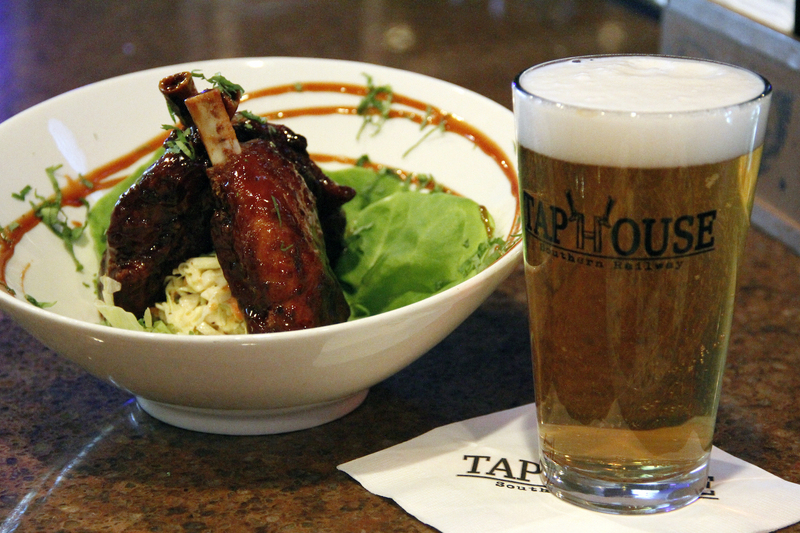 Their Chipotle Pork Shanks were immediately suggested as it’s a house speciality and favorite. I can totally see why with three pork shanks seasoned, double-cooked, coated in their Chipotle BBQ glaze and served on a bed of slaw. The sauce had a smooth consistency with a hint of sweetness to start and a spicy kick to finish and the meat was juicy and tender. Next up was the Sushi Tuna Wrap. This is a really cool concept as they’ve replaced the traditional rice exterior with a tortilla wrap and panko crumbs and flash fried for a great crunch. Talking to Chef Ed his vision for the menu is elevated comfort food – uncomplicated and familiar but with a delicious twist. This fell perfectly into that category and is an awesome option for a decadent finger food. Now, I am a macaroni and cheese LOVER. So when I saw Mac and Cheese Rolls I had high hopes. And they did not disappoint. These are sure to be my go-to at SRTH as they are everything I want sitting around with friends, having a beer and casually eating the entire appetizer hoping no one notices. An eggroll packed with mac and cheese and drizzled with bacon jam, they are the childhood favorite you crave wrapped up for eating ease and topped with a flavorful punch.. and then dipped in bacon sour cream for good measure. So good! Last but not least was the Spicy Shrimp Wrap, a lunch item making its way to the menu. Again, delicious, with crispy fried shrimp, sriracha and an asian slaw. The wrap had great texture and the slaw helped cool down the heat from the shrimp. The shrimp wasn’t heavily breaded or greasy which helped keep it light and tasty. I was also a fan of the fries which I was happy to see served as a side with most of the sandwich options. Then they brought out a bowl of their Pepperoni Chips. This is the type of treat that I wish I could think of and wow my friends with because it’s so simple yet totally delicious and addictive. Sadly, I’m not creative enough so I’ll make due with stealing Chef Ed’s recipe.. Such a great idea and the perfect salty compliment to a cold beer. Note: I do a fair amount of media tastings and I’m almost positive this is the first time I’ve actually said yes to a to-go box. Not only did I accept the offer, I actually ate everything again when I got home. Glancing at the menu, which is a work in progress, I’m excited to check out the Grilled Edamame, Pork n’ Belly Tots and their twice cooked Jumbo Chicken Wings (I’m going right back to that Chipotle BBQ). Overall, everything was delicious, the beer list was on point and the people were friendly, professional and passionate about their business. Chef Ed knows his food and is bringing a blend of American, Asian and South American flavors to the menu with Chef Alain bringing them to the table. Henry knows his beer and booze and is marrying our beloved locals with tried and trues. Their vision to have something for everyone is coming together and is sure to pay off. Keep an eye out for Happy Hour, Beer Dinners, Trivia Night and more as they settle in and get things going. And while they aren’t a “sports bar,” they do have a nice number of TVs if you want to catch a game. SRTH is about enjoying food and a drink in the right atmosphere with a sense of community and I think WPB is going to love it.